A flexible 30-port KVM Matrix which can be re-configured to match your exact requirements. High-performance HD KVM matrix switching system for smaller multiuser applications. 30-port digital KVM matrix switch with (7) fixed user ports and (23) configurable ports. Features a visual OSD so that all systems can be seen on the screen at the same time. 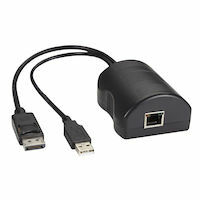 Supports multiple users on Windows, MAC, and Linux-based computer systems. Designed for small and medium sized applications. Migrate from analog to digital KVM. 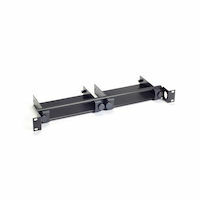 Supports server access modules (SAMs) and receivers using shielded CAT6 cable. Small in size, but large in features and performance, the DCX3000 is an ideal solution for process monitoring and control, broadcast studios, medical labs, test beds, and advanced data centers where the personnel numbers are lower than in enterprise-sized organizations. The DCX3000 is an attractive option for small to medium applications with 30 ports to support a combination of users and servers, with the supported maximum of23 CPUs/servers. Interface-powered server access modules (SAMs) extend DVI or DisplayPort and USB signals over shielded CAT6 or higher rating. In a Matrix setup, the SAM (Server Access Module) can be up to 10m from the DCX switch, and the User Station can be up to 50m away from the DCX switch using shielded category rated cabling. 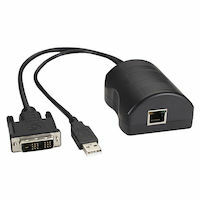 In a Point to Point setup where the SAM (Server Access Module) connects to the DCX Receiver directly, you may extend up to 50m from the SAM to the Receiver. The SAMs support audio via the USB interface, and the receiver can output the audio through the 3.5-mm jack. Not every broadcast studio or control room needs a large, expensive KVM matrix switch with all the bells and whistles. The DCX3000 has an attractive price point for smaller applications while still providing crystal-clear video and fast matrix switching. The unique and easy-to-use graphical interface is more intuitive to use than a text-based on-screen menu (OSD). Choose from auto-refreshed preview thumbnails, which are larger and easier to see. The GUI shows all connected devices in a layout that makes the matrix simple to view at a glance. The DCX3000 delivers every pixel of every video frame with zero compression and zero latency, fulfilling the needs of even the most demanding graphical applications an guaranteeing perfect video synchronization for multiple display applications. Secure system configuration is provided by the Web user interface, which is also compatible with tablet and mobile devices. The UI gives an administrator control for connected devices, enabling the choice of video only, shared, private, or exclusive access modes to be set up. In private mode, other users are able to view the shared video, but have no keyboard and mouse access to the target. In exclusive mode, no other user has access to the configuration. Must be used with shielded CAT6 cable or higher category. The 30-Port Digital KVM Matrix Switch comes with a standard 2 Year Double Diamond™ Warranty (Standard) already included.